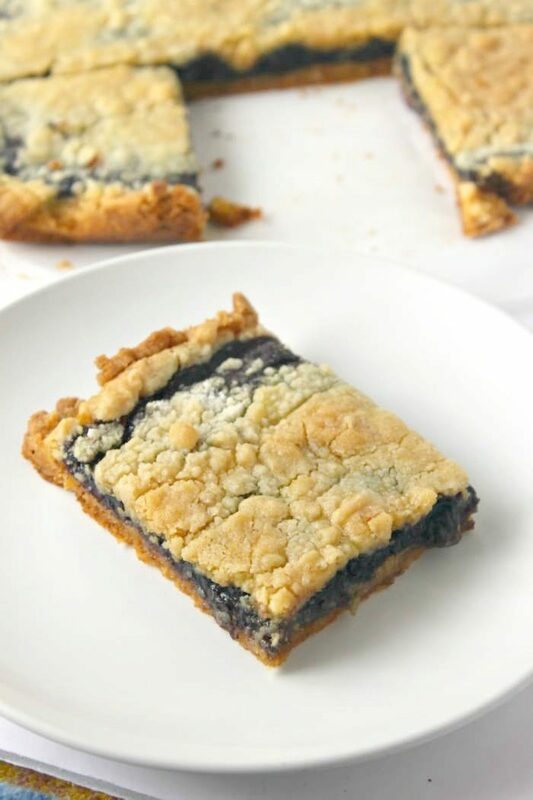 A easy dessert with less than 5-minutes prep and just 3 ingredients, these Blueberry Pie Bars will quickly become a favorite recipe. You’re craving something sweet, but absolutely don’t want the mess of bowls, measuring cups, and ingredients littering your counter. 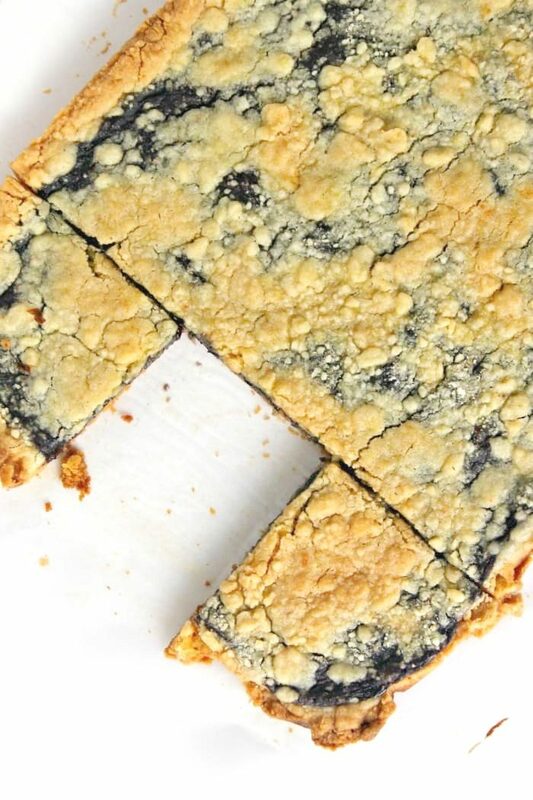 That’s where this recipe for easy blueberry pie bars really shines! These bars are so easy to make with just a cake mix and pie filling, magic! 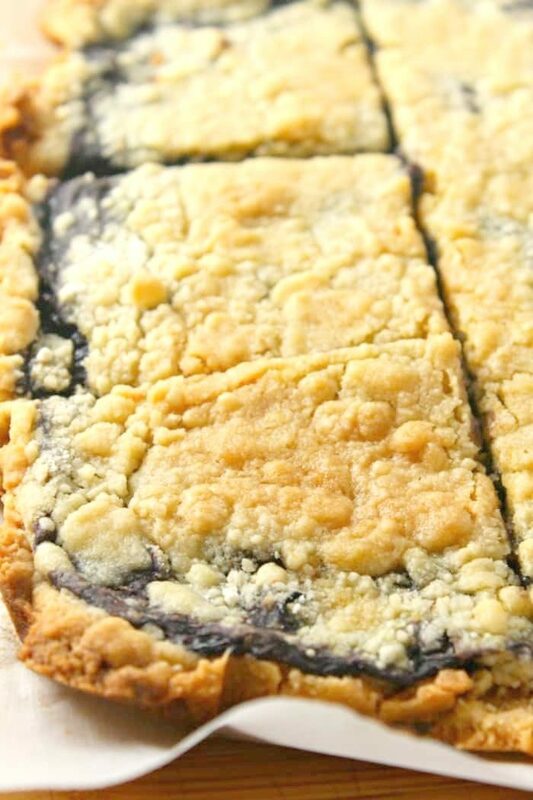 Do you have a cake mix and a can of blueberry pie filling in the pantry? 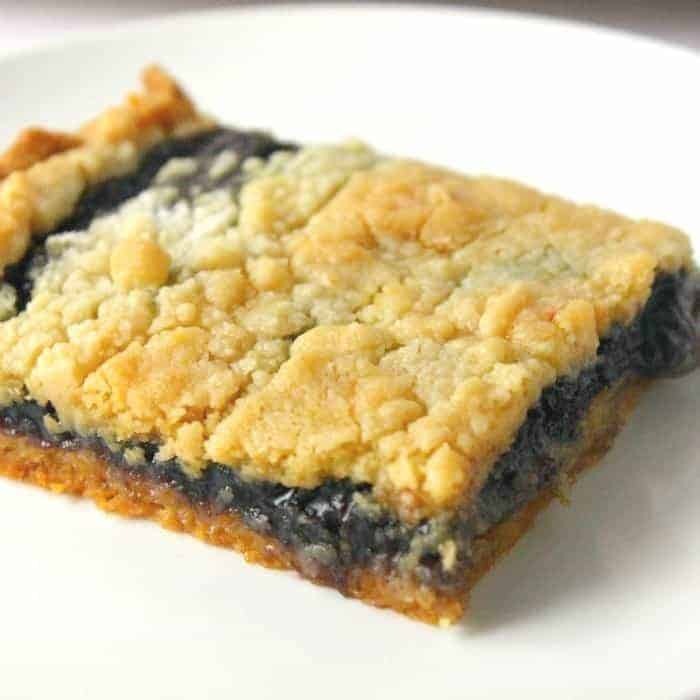 If so within no time at all you can have these delicious blueberry pie bars, that are an all-star recipe! These items I consider staples in our home because these bars are go-to. You can whip them up so quick and easy, it makes for a great dessert. Boxed cake mixes come in handy in our home, you can toss in some pie fillings create cobblers, dump cakes, and even bars like this. When they go on sale, I like to stock up, so that I have some mixes on hand. My two favorites to buy are yellow and chocolate cake mixes, they are the best for revamping into decadent desserts like this! When you take a basic cake mix from a box and add in new ingredients, it can create a fancy new dessert that your guest will be reaching for seconds! You can make these bars truly so fast, just with the butter you cut it into the cake mix, press all but one cup of the mix into the baking dish, spread the filling over, and then sprinkle the remainder of the cake crust mix on top and bake. 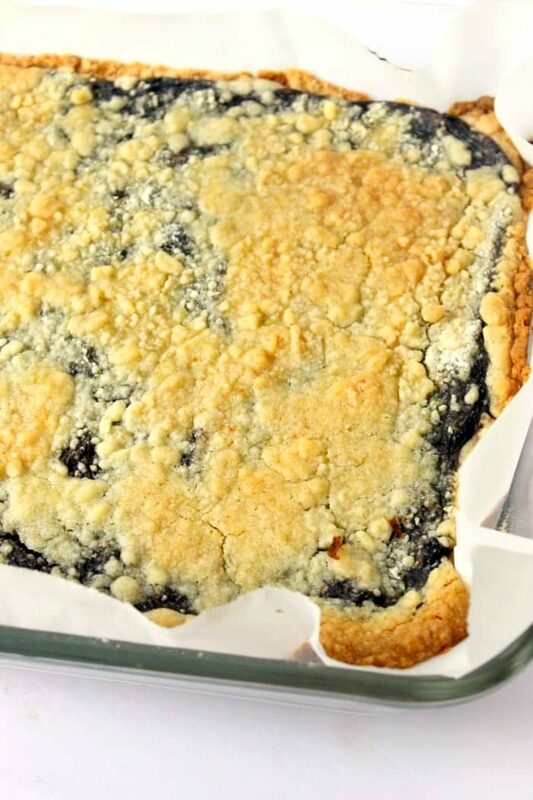 Then bake and when you pull out of the oven, you have these delicious bars! A easy dessert with less than 5-minutes prep, these Blueberry Pie Bars will quickly become a favorite recipe. Cut the butter into small cubes. In a large bowl, cut the butter cubes and cake mix together with a pastry cutter, or two forks, until crumbly. Set aside 1 cup of the mixture. Line a 13x9" baking dish with parchment paper or cooking spray, dump in the remaining cake mix/butter mixture into the bottom of the baking dish at press it down with your fingers to pack it together over the bottom baking dish and slightly up the sides. Drop spoonfuls of the pie filling over the packed crust mixture, and carefully spread it with the back of a spoon as evenly as possible. Sprinkle the reserved cup of the crust mixture over the pie filling and bake for 35-45 minutes. Cool Completely, cut into 12 squares, and serve. I have fresh blueberries; do you have recipe where I can use them? Thanks. Thanks for the recipe! I added fresh blueberries and it is in the oven now. Smells amazing! 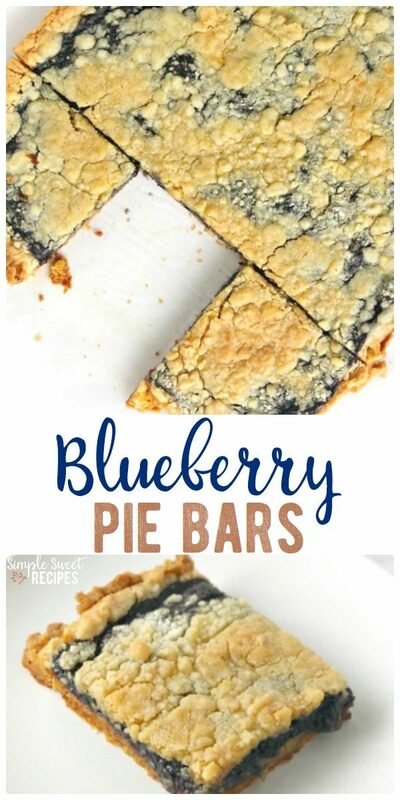 This look wonderful, however 9 x 13 pan are a lot of bars. Can this be made in an 8 x 8 pan? Sure, they’ll just be thicker! Thanks Janel. Obviously this will also affect the baking time. You will have just as much using a smaller pan! They will be thicker, but the volume staysche same! Freeze some if it makes too many. Do you still mix the cake mix the regular way before pouring it in the dish? Nope, you won’t mix up the dry cake mix with water or oil or anything else. Just use the dry mix with butter to make a crumbly topping! Do these need to be refrigerated? I’ll be making them the day before. Will this work with cherry pie filling ?